I LOVED the libraries at my schools. They were my sanctuaries. As an awkward, socially inept child, and later an odd teenager with quite different interests to most of the kids around me, they were places I could go during recess and lunch breaks that were largely unpopulated, quiet, and safe. I got to know the librarians - to the extent that, in high school, the librarian kept new books for me before they'd even been processed, knowing I'd already worked my way through the fiction section by midway through year ten. It was a golden age of school libraries too - lots of classics, lots of what have become classics in the new literature, and as I recall, a dearth of vampires! To this day, there is a significant chunk of my collection of children's literature that has come from decommissioned library books - treasures I've acquired for, at most, a few dollars apiece. Even when I got to university, the library was a wondrous place. Again, at times, as I navigated my way around a new, much bigger learning institution, it was a sanctuary - even if some of the tomes on the shelves were a little scarier than the ones in the school libraries. 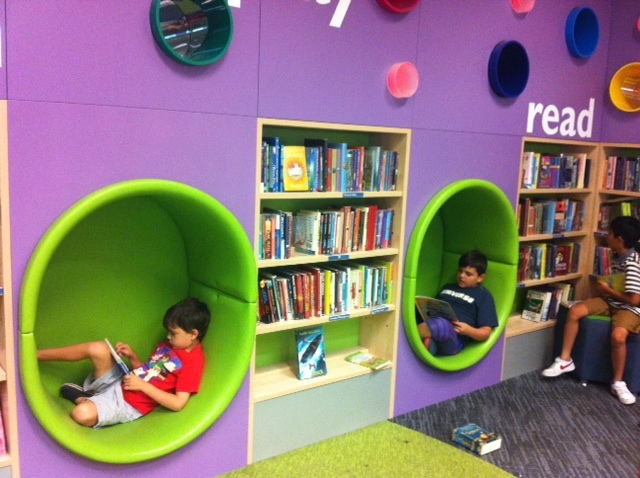 I found this marvelous selection of images of innovative new school libraries on my Facebook feed and it got me thinking back. I love some of the ideas used in the libraries in the photographs, and I'm particularly tickled by the ones of the two schools in the Bronx in New York - a whole program to redecorate and make enticing the libraries in districts where children are significantly disadvantaged. Hopefully, many of those kids will find sanctuary in them as I did, and who knows, maybe some of them will grow up to have rooms in their houses that are home to so many books that they can, quite legitimately, be called libraries too! Loved the pictures of libraries, they are magic spaces. Working with virtually no funds has made making inviting space and displays a challenge but one of my favourite displays has involved going and grabbing something like a large box for a fridge or huge screen tv from a retailer and then turning the box into a tree, a splash of brown poster paint and some clever reinforcing on the branches. Then I just cut out as many leaves as possible from cheap green cardboard and leave the leaves for students to write the titles of favourite books on and stick on the tree. The last time I did this I was impressed by the number of kids who also went and wrote favourite passages from books on the leaves. Really love trying to make library space as inviting and as magic as possible. That sounds like a great project, Arabella! I remember my primary school librarian doing similar things to engage us with the library and reading - not that I needed prompting!! She ran a readathon when I must have been about 10 or 11 - I'd read the minimum number of books before most of the kids had finished the first couple, and kept plaguing her to give me more! I'm sure I must have driven her bonkers - in a good way, though, I hope!